Pulled pork is a Southern United States classic! The pork shoulder is cooked long and slow, then shredded and served with a tangy barbecue sauce. The pork shoulder is a less tender cut of meat, which must be cooked on the barbecue for between 5 and 8 hours. Sprinkle the pork shoulder generously with rub and massage in on all sides. Set aside for an hour to allow flavours to penetrate the meat. Soak wood chips in water for a minimum of 1 hour, before starting the barbecue. If using a smoker box, follow the manufacturers directions, and place below the cooking grids, otherwise wrap wood chips loosely in a double layered pouch of foil. Pierce the foil 8 – 10 times with a large fork. To cook the pork over indirect heat, place a drip pan on the vapourizer, on the right side of the grill. Place the smoker box or foil pouch on the grids on the left side of the grill. Close the lid and preheat barbecue on HIGH, until the wood chips start smoking, about 15 minutes. Maintain the heat as low as you can, between 250°F – 300°F. Place the pork shoulder, fat side up, over the drip pan, on the right hand side of the grill, which has the heat turned OFF. Grill slowly on LOW temperature. To maintain an oven temperature of 250°F, you may have to reduce the temperature to MEDIUM. Cook for 4 – 7 hours, until internal temperature of pork has reached about 170°F. Meat will be so tender that it can be shredded, or pulled with a fork! Let pork sit for 15 minutes, covered with foil. 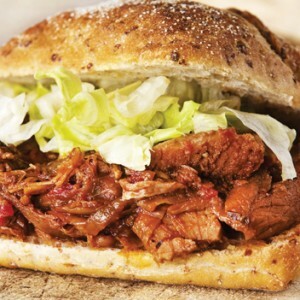 Shred or cut the pork and serve it on crusty buns, accompanied with your favourite barbecue sauce. This entry was posted on Tuesday, March 25th, 2014 at 10:25 am	and is filed under Barbecue Recipes. You can follow any responses to this entry through the RSS 2.0 feed. You can skip to the end and leave a response. Pinging is currently not allowed.